Hepburn Harrison-Graham worked as a professional actor from 1979-1991 and has appeared in a variety of films and TV programmes, including Dirty Rotten Scoundrels, Cry Freedom, The Firm and Eastenders. My stage work included a season at the Royal Shakespeare Company. In 1992 he began working for BBC radio sport. He started as a junior broadcaster but quickly became an assistant producer. During the formative years of radio 5 live he was fortunate enough to produce a wide range of programmes. Among them were. Hoops, an original programme about English basketball. Sports America, an insight into American sport, and Sunday Sport. During this period he also devised and produced a number of documentaries. The most notable being Across the White Line a four part series that chartered the history of black footballers in England. In 1996 he worked as a producer at the Olympic Games where, among other things, I produced a critically acclaimed radio documentary on Martin Luther King. Later that year he became a boxing producer, and was lucky enough to produce some of the most iconic fights in boxing history. Hepburn held that position for seven years before becoming an assistant editor. In 2008 he became the first black editor in the history of BBC radio sport. 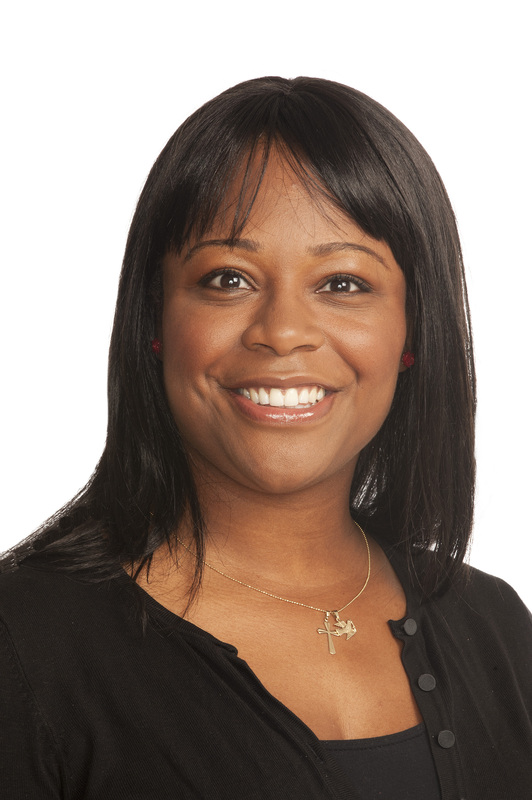 Janine is responsible for the development and implementation of Sky’s Diversity and Inclusion Strategy. This high profile role involves ensuring that recruitment, development and promotion opportunities are open to all and that talent and a good work ethic are the key criteria for a successful career at Sky. Janine chairs the BSkyB Diversity Comms Board which is responsible for aligning diversity and inclusion activities on and off screen to ensure that Sky represents the UK community. Janine has been at Sky for over 4 years and has worked across a number of business areas in that time. Before joining Sky Janine was a management consultant working in the UK and overseas. Janine is a member of the Inspirational You Board. Modern History, Economic History and Politics. What did you want to do when growing up? Barrister, pop star, teacher, doctor, house wife – I wanted to do all of these things for one day each week. How did you get a job at Sky? The scope of my job is vast so every day is completely different. At the moment I’m developing a strategy to encourage up and coming female talent in Sky, setting our diversity goals for next year and reviewing the feedback from our work with the Mama Youth Project to encourage young people from underprivileged backgrounds into the media. I spend a lot of my time in meetings, developing diversity strategies and influencing key stakeholders – great thing is I’m never bored. What do enjoy most about your job? All of it, honestly! I’ve had a really varied career and this role plays to my strengths while allowing me to add a creative and passionate flair. If I had to pick one thing I most enjoy it would be the opportunity to work with and have an impact on all of the different areas of Sky. What tips do you have for someone wanting to break into media? Do your research. I am constantly asked to help people get ‘into’ Sky, which I’m happy to do but you need to have some idea of what you want to do as there as so many opportunities in so many different business areas. Make the most of every opportunity. If someone gives you the chance to gain experience in something new or to show you can add value to something make sure you take the chance as you never know where it might lead. Take ownership of your career. If you don’t like your current role develop a plan to get you to where you want to be. Accept that this may involve developing yourself outside of your current role and in your own time. It’s no one else’s responsibility to develop you so if you want something it’s up to you to make it happen. Sheffield university graduate Liam has been working at SB.TV since January 2010 and besides Jamal, is the longest serving member of the team. Wigan-born Liam got in touch with Jamal while working on his dissertation on the UK grime scene. Liam has also done some consultancy work for Simon Cowell‘s record label SYCO and has written for i-D magazine. SB.TV is an innovative ‘music and lifestyle’ youth media platform with a ‘Global’ reach. To date the channel has amassed over 100,000,000 views on the Smokeybarz YouTube channel. We are an online broadcaster come production team, and we understand our audience, because effectively, we are our audience. There are no particular boundaries at SB.TV which allows us a creative freedom when producing high quality, unfiltered, unbiased, content that we hope will serve as entertainment and inspiration. Having built something from scratch organically, which has now evolved into a powerful machine for artists to showcase their work; SBTV has never done this for any other reason than our passion for music and the creative industries. Liam what did you study at University? The Damilola Taylor Trust/Spirit Of London Awards and ChildLine. 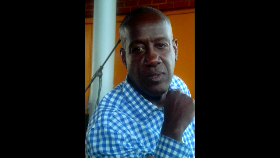 Ray Paul’s career has seen him work for the BBC for over 20 years before starting his company, the playmaker group. While at the corporation, he worked for a number of radio stations, most notably running BBC London from 1997-2001. In 2001 he was asked to be part of the initial set up team that started a new digital radio station, 1Xtra. He held the position of Executive Producer of Specialist Music & Live Events for 7 years before moving to Radio 1 and being Head of Weekends in 2009.
the playmaker group is a uniquely creative company who oversee a host of key areas in entertainment under one umbrella group. These areas include Media and Content Production, Event Production & Management, Representation and Consultancy & Training. They have a strong history & reputation of managing DJs, entertainers and artists on a national and international scale from BBC Radio 1, Capita FM as well as a vast consultancy experience working with various brands, celebrities, creative businesses, media and youth organisations to help facilitate and execute their plans, aims and objectives. What is your background in the entertainment industry? I’ve had several years’ experience of working within the entertainment industries. Served 8 years as a signed recording artist ‘Cookie Crew‘ and have served over 15 years as a Corporate Marketing, Promotion, PR and Entertainment professional. I’m also a creative consultant (Fortune Cookie Marketing & PR) specializing in media relations, marketing campaigns, promotion, events, communications & pr. 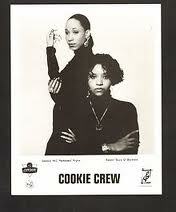 Who was the Cookie Crew? 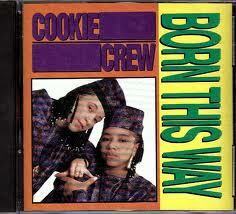 Cookie Crew’s career took off after winning a National Rap Competition at The Wag Club in 1985. After winning the competition, this was the beginning of what was to be a very success career. 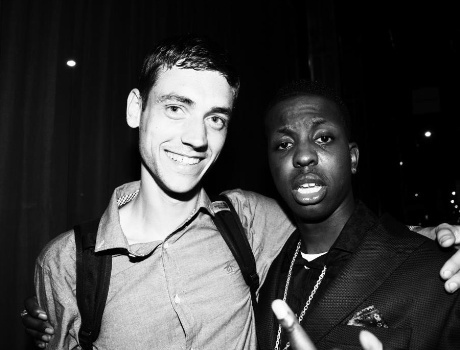 We went on to do lots of shows in London and around the country and as our reputation started to build we became a prominent and respected fixture on the Hip Hop scene, working with various dj’s and producers. I was a Chef at the Ministry of Defence at the time and my dream was to give up my day job to pursue a career as a recording artist. In 1986 we met the Beatmasters and was working with them on voiceovers for TV ads. We began working together and ended up recording ‘Rok Da House’ which became a hit single, followed by a 2nd single ‘Females’. Both were released on Rhythm Kings Records and opened us up to a more commercial audience and fan base. In 1988 we went onto sign an international recording contract with London Records (Polygram Worldwide) and also signed a publishing deal with Virgin/EMI. With this under our belts we were able to fulfill our dreams and go to New York to record with some of our favorite Hip Hop artists (Gangstarr, Blacksheep, Stetsasonic and Davy DMX). This gave us International exposure and we also worked with the likes’ of Roy Ayres and Edwin Starr. We delivered several hit singles and had the pleasure of touring with some of the greats during that time: Bobby Brown, Guy, Public Enemy, EPMD to name a few. We were also doing our own headline tours in the UK and toured extensively around Europe. When did you change career path? Around 1994, assisted by The Princes’ Trust, I set-up a promotions company organizing club nights, events and securing event sponsorship deals. From here I started working at MCA Records and in 1996 went to work for Universal Music. I went from strength to strength and have had the pleasure of working at some of the best companies in the world, absorbing how the international wheels turn. Who have you worked with in the music industry? I’ve worked the records of some of the biggest names in the music industry inc. Missy Elliott, P. Diddy, Brandy, Lil Kim, T.I., Lupe Fiasco, Musiq Soulchild, KRS-One, Raekwon, RZA, Eyrkah Badu, Mary J Blige, Blackstreet, The Roots, Tech Nine and Krizz Kaliko. I’ve worked for various Major and Independent Records Labels/Marketing & Entertainment Companies including: Universal Music-UK, Atlantic Records- UK, Koch Entertainment New York, SMC Recordings-San Francisco, Strange Music Inc.-Kanas City, Propas International Rights Management-Canada, RSK Entertainment-UK, Timezone International-New York, MOBO and AEG/The O2. All my experiences and job opportunities over the years’ have enabled me to set-up on my own company offering a bespoke consultancy service to the music industry (UK & US). My knowledge set the foundations, for me to continue a career within the industry. Having spent years as a music fan and then a recording artist, I was able to migrate my skills and knowledge over to the other side of the business. My charitable interests lie with young people and education! I’m also a member of Diaspora UK, a non-profit Music Foundation supporting equality in the British Music Industry. Inspirational YOU presents an evening masterclass featuring five professionals from the world of TV and radio. Our panellists have ran national radio stations, lead teams of 100’s on news stories across the globe and have worked with A list celebrities throughout the world. They all started their careers from very humble backgrounds and are now leading the way by influencing what we see and hear via the media. Charlene White – Journalist and Presenter (Host) & supporter of Inspirational YOU. This masterclass is ideal for social entrepreneurs, students, business leaders, those in media, events, journalism, marketing, aspiring entrepreneurs or those who want to network and raise their profile. Learn how you can get ahead in the media. Learn how to get noticed and be effective so you can get radio or TV coverage. Learn the tips and tricks needed to build your brand and create a niche brand. Hear how you can bounce back after rejection from journalists and producers. Adapt the skills needed to excel when you do not know anyone in the industry. Find out the various opportunities in the media. Learn how they have sustained their careers and how you can too. Network and build your contacts. Inspirational YOU – Educate. Connect. Empower. Inspirational YOU returns on Saturday 31st March, 11am-6pm with another powerful line up of speakers who will inspire, support and give industry tips. This is a fantastic opportunity for individuals to meet some of the UK’s most influential professionals, academics and leading entrepreneurs. 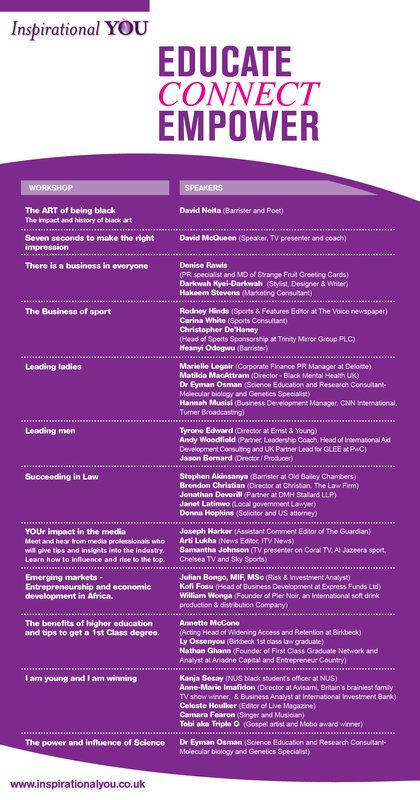 Speakers come from Tooks Chambers, Old Bailey Chambers, Guardian, ITV, Ernst and Young, The Voice, CNN, The Mirror, Deloitte and PwC. Tickets to the event are limited at £5.00 and are free to University of London students. Email: bookings@inspirationalyou.co.uk or telephone 07545 156 111. What are you doing on March 31st that will give you access to a range of highly talented professionals who are willing to share their key areas and pointers from their career success with you? Nothing! Well you can come along to the first 2012 Inspirational you where you’ll have just that. A fantastic opportunity for you to meet some of the UK’s most influential professionals, academics and leading entrepreneurs. Speakers come from Tooks Chamber’s, Old Bailey Chamber’s, The Guardian, ITV, Ernst and Young, The Voice, CNN, The Mirror, Deloitte and PwC. Peckham have been working with The Rafiki Network on their own campaigns as part of the Staying Safe Project. violence message, whilst delivering educational workshops in schools within their respective boroughs. Following the success of Inspirational YOU’s last event at the UK Supreme Court, they have returned with a line-up of world class professionals from a wide array of industries that will inspire and motivate attendees. Taking place at the vibrant Birkbeck University in the centre of London, this is a fantastic opportunity to meet some of the UK’s most influential professionals and leading entrepreneurs. 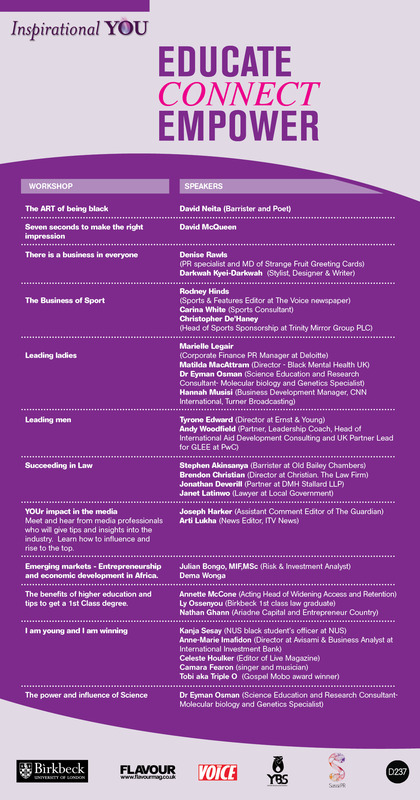 There will be over 30 speakers spread over 12 seminars from leading corporations such as the Guardian, ITV, Ernst and Young, BBC, Sky,The Voice, CNN, The Mirror, Deloitte and PwC. This day is ideal for Social Entrepreneurs, students, graduates, business leaders, those in Law, Art, Emerging markets, Science, Journalism, Marketing, Media, Sport, leadership, aspiring entrepreneurs or those who want to be empowered. 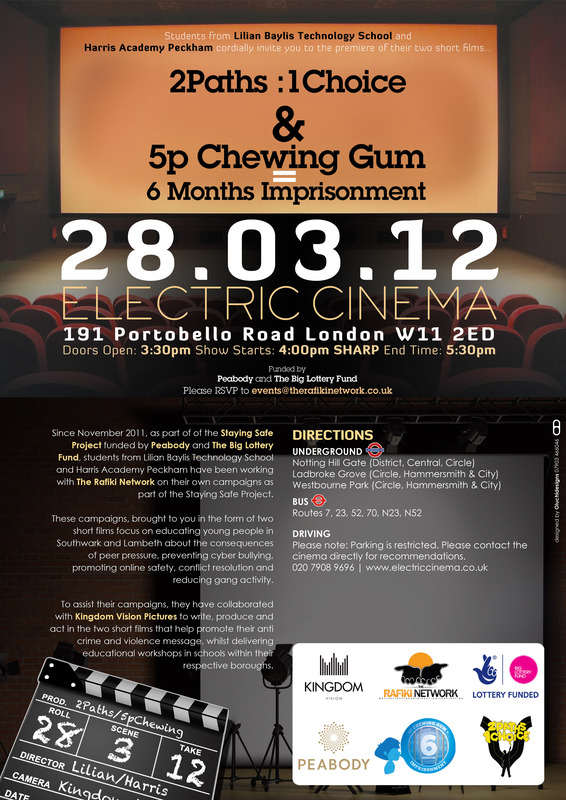 Limited £5.00 tickets and FREE to University of London students.